Wchat is a popular responsive php ajax inbox messaging (Chat) WebApp for websites, mobile apps and control panels. 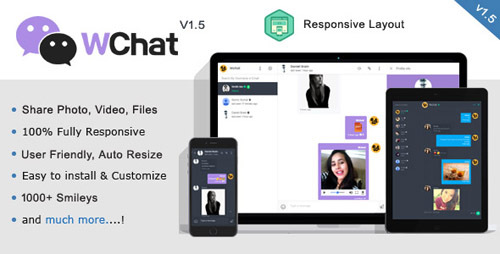 It is a responsive chating app that is Built with PHP/MySQLI-PDO and design with CSS framework Bootstrap 3.3.6 It utilizes all of the Bootstrap components in its design and re-styles many commonly used plugins to create a consistent design that can be used as a user interface for web and mobile applications. Wchat is based on a modular design, which allows it to be easily customized and built upon. This documentation will guide you through installing the wchat and exploring the various components that are bundled with the wchat.